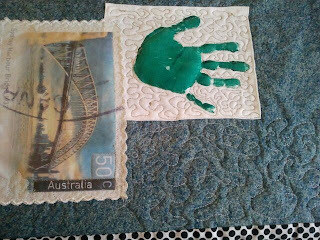 “Hand prints and Stamps Quilt” is a quilt made for my son Murtaza and was given to him for his 21st birthday. We designed this quilt to encompass his childhood memories. 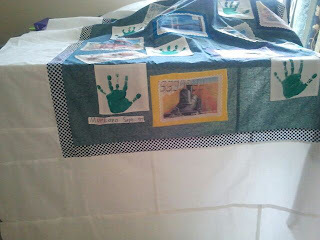 To make this quilt special for Murtaza we came up with this concept of using stamps from his collection and his hand prints made on a tea towel in Kindergarten. The stamps were very tiny (possibly 1.5” x 1”), which were then scanned on my CanoScan LiDE 200. Once scanned, the image was enlarged to fit an A4 size printable fabric sheet. Printable fabric sheets are available from any good quilt store. They can be fed through any normal ink jet printer and uses the same ink used on paper. Once the image was printed, I peeled it off and hand-washed the printed fabric sheets to ensure that there was no colour run. Once dry, the picture was allowed to set for 24 hours before ironing. I then used my Husqavarna SE to do a ric rac type of edging with my embroidery thread to give it a stamp like finish. 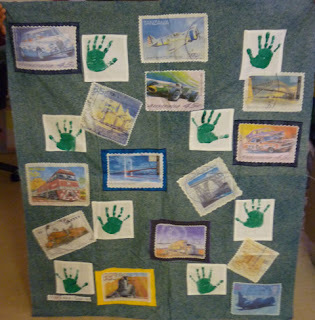 The finished stamp images were then sewed onto a piece of fabric to give it a framed look as shown in the images below. The Quilt layout is essentially a plain rectangular centre piece, border 1 – two inches wide and border 2 – about 15 to 20 inches wide. 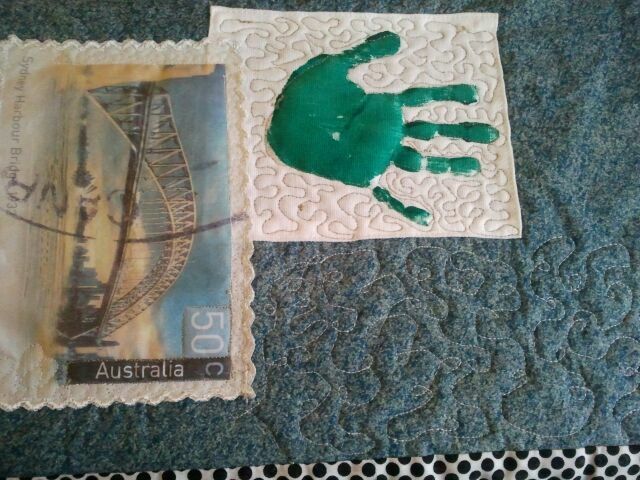 The stamp images and hand prints were placed in the rectangular centre piece to give a lovely scattered effect as shown in the picture below. The quilt was quilted using free motion stipple quilting design. 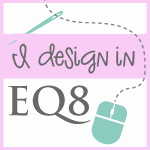 This was my very first quilt, where I ventured to quilt, using the free motion quilting technique. The borders were professionally quilted. I am sorry I don’t have a close up of the quilted borders.